We love how stylish, adaptable and fun this piece of furniture is! 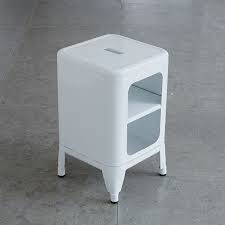 You can use it as a stool, a bedside table, an end table, a bathroom storage unit or a small step, either indoors or outdoors. The perfect addition to any home, you'll wonder how you ever got by without it! Pressed sheet steel with a powder coated finish. For use indoors or out. We recommend storing indoors during heavy or prolonged wet periods. Dimensions: 50x30x30cm Estimated delivery time: 1 week.